On August 6, 2016, BMC Racing Team’s Belgian rider Greg Van Avermaet won the gold medal in men’s individual road race event at the 2016 Summer Olympics in Rio. 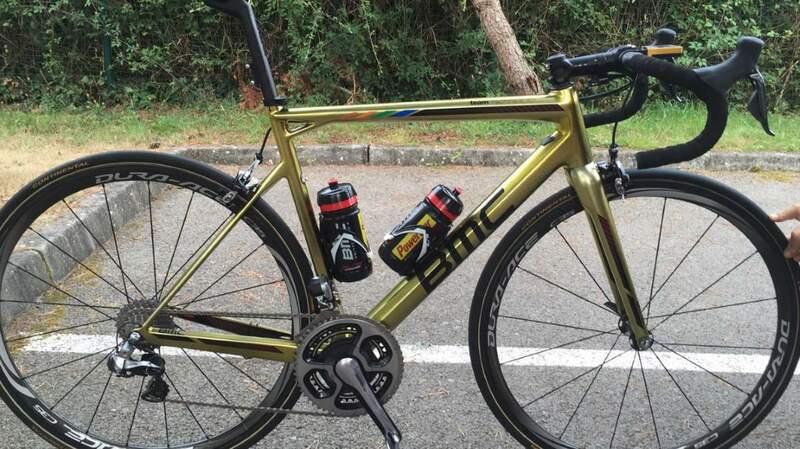 The Swiss bike manufacturer BMC has gifted him a special golden-painted Teammachine-SLR01 bike to honor his success. On their twitter account, the BMC Racing Team have published this beautiful bike’s photos. Its power meter and fi’zi:k saddle get some gold touches as well. On the side of the top tube, the colors of the Olympic rings have also been painted. The bike is equipped with the team issue Shimano Dura-Ace C35 wheels and Dura-Ace Di2 groupset. 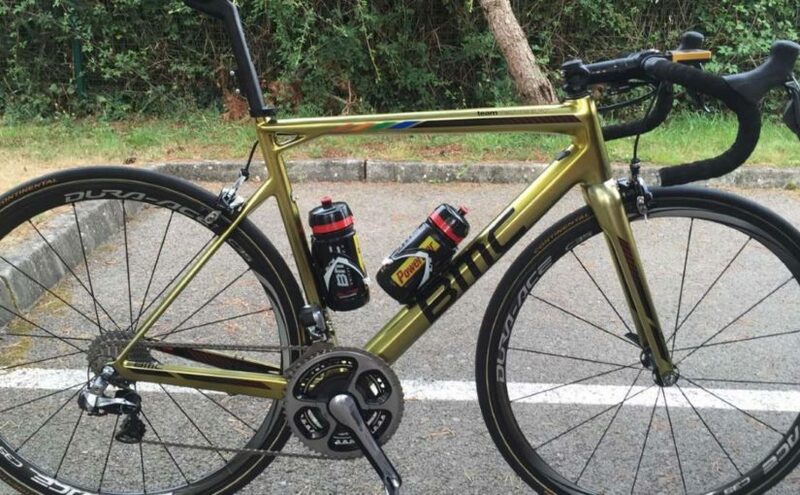 Greg Van Avermaet’s golden painted BMC Teammachine SLR01 bike. Photo: BMC Racing Team on Twitter. Fi’zi:k saddle. Photo: BMC Racing Team on Twitter. 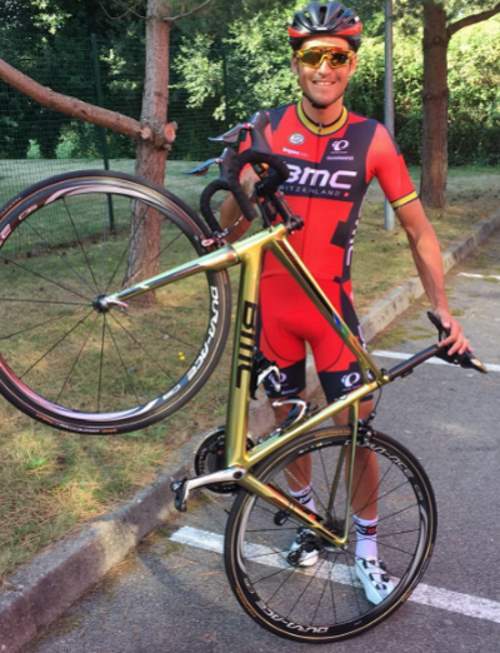 Greg Van Avermaet shows his special bike. Photo: BMC Racing Team on Twitter. The 2016 season was a great success for Greg Van Avermaet. He opened the season strong with numerous top-5 placings in the Tour of Qatar and Tour of Oman. In late February, he won Omloop Het Nieuwsblad, after beating Peter Sagan in a five-man sprint in Ghent. He finished sixth in Strade Bianche, before entering Tirreno–Adriatico, where he was on the winning team of the opening team time trial. After the cancellation of Tirreno’s queen stage, he won the sixth stage in a sprint with Peter Sagan, and successfully defended his lead in the final time trial of Tirreno–Adriatico with one second over Sagan – his first overall win in a World Tour stage race. The victory pushed Van Avermaet to the top of the UCI World Ranking for one week. Following Tirreno, he finished fifth in Milan–San Remo but crashed and broke his collarbone in the Tour of Flanders. After his return from injury, he entered the Tour de France. He won stage 5 in Le Lioran, his second Tour de France stage win, after a long breakaway and having completed the final 17 km solo. He also captured the yellow jersey, which he held for three days. On 6 August 2016, he won the men’s individual road race at the Summer Olympics in Rio de Janeiro. He initially joined a six man breakaway on the first of three passes of the 25.7 km (16.0 mi) Vista Chinesa Circuit loop, and managed to stay in contact with several climbing specialists on the next ascents. Van Avermaet was distanced by Vincenzo Nibali, Sergio Henao and Rafał Majka on the final climb, but after Nibali and Henao crashed out of the race on the final descent, Van Avermaet tandemed with Jakob Fuglsang to catch Majka on the run-in to the finish. Van Avermaet won the three-man sprint on Copacabana beach to earn the Olympic gold medal. Greg Van Avermaet debuted his newly painted bike at the Bretagne Classic – Ouest-France on August 28, 2016. It was his his first racing appearance since the Olympic Games on August 6. Photo: BMC Racing Team on Twitter.